When determining the amount of power your panels will produce you have to look at several factors that influence their output. The Wattage of the panels are based on operation in full sun during the coolest times of the year. When using a 12 volt dc solar system the charging voltage for the batteries will be reduced slightly by the charge controller based on its charging algorithm. Multiplying the hours of full sun X the average output will give you an approximate Ah (Amp Hours) of charging ability. Depending on your battery type, not all power will be able to be absorbed by your battery bank. Many battery types can be less than 50% efficient at power absorption. Although a battery that is not drained by more than 50% will be able to use more of the charging power. Lithium batteries can absorb more charge and also can be drained down to 10%, so lithium can sometimes be a better choice for RV solar systems. It’s very important when installing these kits that you make sure the polarity is correct from the panel through the solar controller to the battery bank. One wrong wire can shut the whole unit down. The Go Power Panels are conveniently labeled along with the charge controllers for positive and negative polarity distinction. Let us know what we can do for you today! Go Power Charge Controllers will show amperage from panels and battery bank voltage. 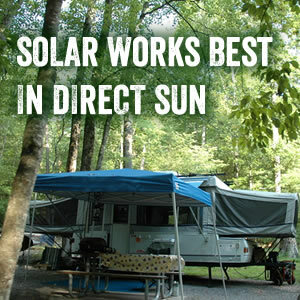 This will allow you to easily determine how much power you are getting from your RV solar kits. Outside Supply offers the best information pre sales support so that you buy the right equipment for your RV, Travel Trailer, Cabin or Fifth Wheel Camper. Give us a call if you have a question.